Tab and speed dial sync features are great, but one extremely annoying issue is you cannot remove old and/or duplicate devices from speed dial and tab sync (with speed dial sync there's a workaround where you can do this via the bookmarks by the side extension, but its not possible at all to do with tab sync). For example if you are running opera stable on your device, and you try out opera dev for a while, uninstall it, and go back to stable, you now have two identical entries for this device in tab and speed dial sync, and the unused one never seems to go away and there's no way to remove it. We really need a way to remove these duplicates, or at the very least they should auto-remove themselves if an entry hasn't been sync'd to in a significant amount of time. I totally agree, and in the latest Beta version, you can remove speed dials! Not device folders on the Tabs page though, but I guess that will come soon too. I do find sync incredibly frustrating. Although I have all the folders set to list view, every so often, randomly, it converts some or all of them back to tiles. 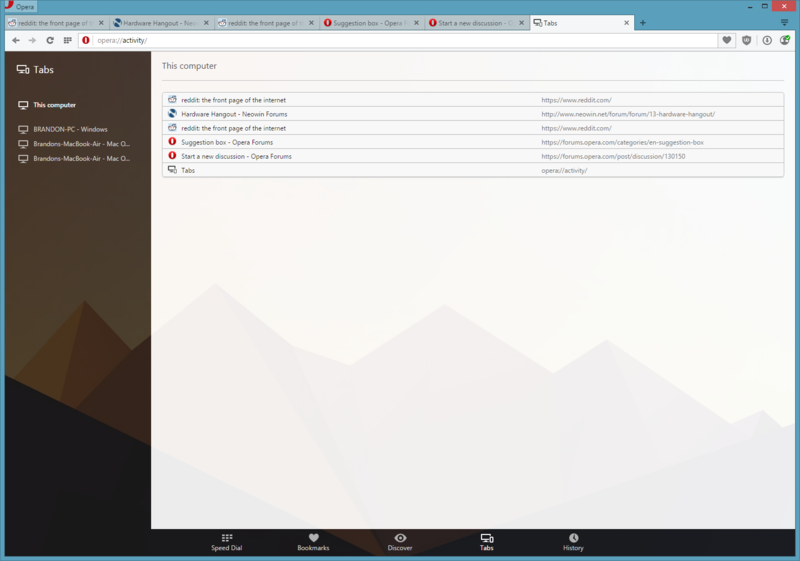 Because I sync between several devices, I have endless duplicates and there seem to be no way to get rid of them; even when I carefully prune them, they come back from the opera server. And the unsorted bookmarks seem to have a life of their own, and multiply alarmingly. And no facility to sort them alphabetically. Does anyone have any advice on how to manage the bookmarks? I know that if I turn off sync on all the devices, eventually when I turn it back on, it will be a nightmare.